Stan James have been in operation for over 30 years and during that time they have build up a loyal customer base due to their wide range of markets and generous betting odds. Compatible with all phones and tablets. No download required. Works on Android, iPhone, iPad, Blackberry & more. 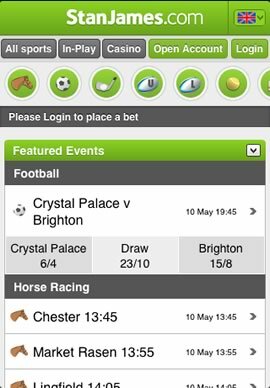 Place a £10 bet and receive a free £10 bet. 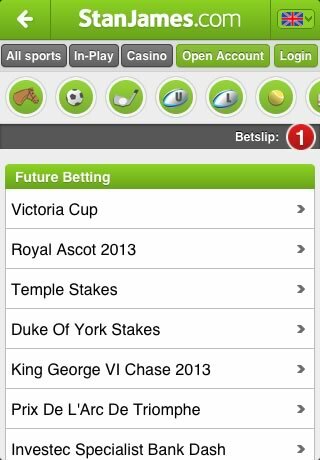 Mobile customers are guaranteed the best odds on all UK and Irish racing. 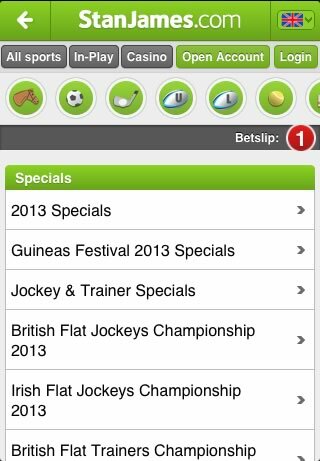 Wide range of horse racing specials available via the mobile site. Stan James have over 30 years of experience in all types of sports betting. Whilst Stan James isn’t the biggest sportsbook in the world, they are one of the oldest. Established in 1973, the company has since then gone on to be a healthy bookmaker in providing customers with a good level of betting opportunities from a range of sports. One of the larger sports on their books comes in the form of horse racing; which will come as little surprise as the sport is one of the largest grossing sports to bet on in the world. The company has been one that has managed to move with the times and the introduction of their betting app underlines this fact. Over the years Stan James has managed to provide a wealth of innovation within the betting industry – such as live streaming – and it’s this fresh approach that the bookmaker continues to adopt that has seem them flourish. 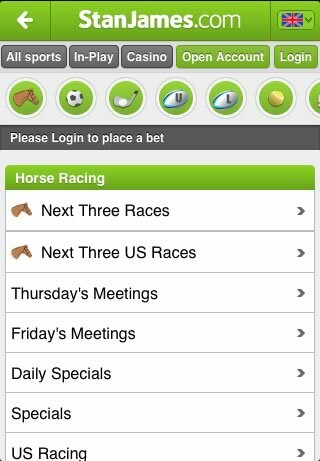 Horse racing is actually a new addition to their betting app. Surprisingly the sport was left out for a long time – for reasons unknown – but thankfully it’s been added and has really added to a well-rounded betting app. 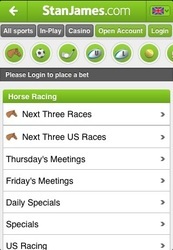 There are two sports which dominate the Stan James betting app; football and horse racing. It’s obvious from the off that these sports provide such a big part for the company and the app, as they are both included within the top sections of the app itself. The list of the upcoming races on their cards for that day is apparent and updated as and when a race completes. 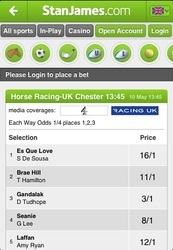 Once into the horse racing section itself you are greeted with a number of options. This will include choosing to look at the race cards for the next three races, all the meetings for that day, daily specials, festival specials and a host of markets from around the world. It’s worth mentioning at this point just how diverse Stan James are with regards to races that they cover. Whilst the majority of bookmakers will cover races from around the UK and Ireland, few cover international meetings. Stan James on the other hand provide comprehensive markets fro racing in America, Australia, South Africa and other parts of Europe. 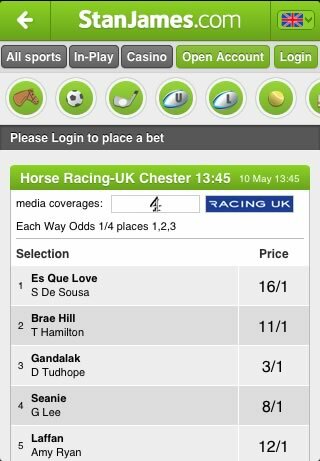 This definitely gives the app a much wider range of punter to target, rather than the usual races on offer. The specials section is something that Stan James has continued to add to over the years. 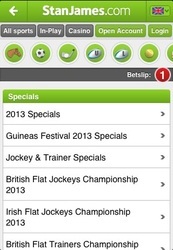 It’s actually now got one of the widest selection of specials of any betting app. These often range from festival specials, jockey & trainer specials, flat racing, national hunt races and a range of miscellaneous markets, which are a little more fun than anything else. So the race cards are arguably the most important section of any sports betting app. Once into the Stan James race card you are met with information that includes which horses are running in the race, the jockey, time of race, ground and then current price. In all honesty, this is pretty slim picking when comparing with some of the bigger bookmakers that the company is trying the challenge. The lack of statistics and even a tipping area really does make it feel a little thin on the ground in all honesty. One section that the app does excel on is its future races, or Ante post for the purists. It has a massive range of markets to choose from, and whilst this will probably vary throughout the years, is definitely something that is working in their favour in terms of people wanting to back horses for future events or races. One thing Stan James has never been afraid of is trying new things in terms of aesthetics. The app definitely has a more ‘fun’ element to it compared to its competitors, with the green and white corporate colours being brashly displayed throughout the app. It’s probably a personal taste, but we really like how the app looks, with the fonts being that bit softer and seemingly a little more light hearted. In terms of functionality, again the app scores highly. The addition of the back button to hop back to previous page, the ability to jump straight back to the home page and the continuous availability of the quick links at the top of each page makes it so easy to navigate about. 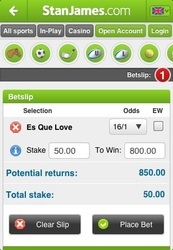 However a frustrating niggle on the app is adding bets to your bet slip. 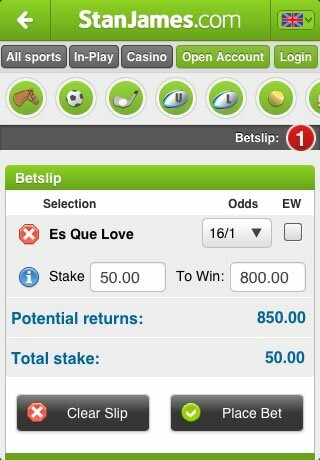 Whilst we are big advocates for having a separate bet slip to the page you are on, sometimes (and this happens randomly which is even odder) it takes you straight to the bet slip rather than simply adding whilst remaining on the market or page you are on. This is a very small niggle, granted, but something that certainly frustrates us. New users to Stan James can take advantage of a free bet worth up to £10. The free bet is a match on your first qualifying bet after you have registered a new account. Once your bet has been placed (at odds of 4/5 1.80 or greater) then the bet will become present within your account to use on any market you wish. 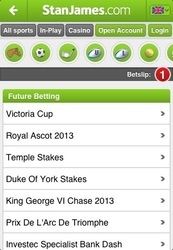 The stake is non-refundable on any winnings from the free bet. Recently Stan James has upped the amount of horse racing specific bonuses and promotions they offer their customers. The first comes in the form of best odds guaranteed. How this work is simply if you place a bet on a horse and the starting price odds are more favourable than the odds you took, then any winnings will be paid out at the higher starting price. Happy Hour is another promotion run which allows you to get the best odds within the industry for just one hour on a Saturday. The promotion runs between 11am and Noon every Saturday for a number of selected races. The newest addition to the armoury is called Nag Me. Nag Me is a se4rvice offered where you can sign up to receive alerts on when and where your favourite jockeys, trainers and horses are next running. 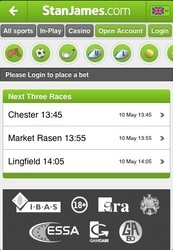 Stan James have made a good job are creating a very solid horse racing section on their betting app. The app works and functions really, and the addition of markets from around the world certainly give it a wider appeal to racing enthusiasts who are looking for more than simply racing in the UK and Ireland. Unfortunately for it to really compete with some of the bigger apps in the industry it has to offer even more than it already does. This is predominantly down to the race card and the lack of information – compared to its competitors – really does let it down. 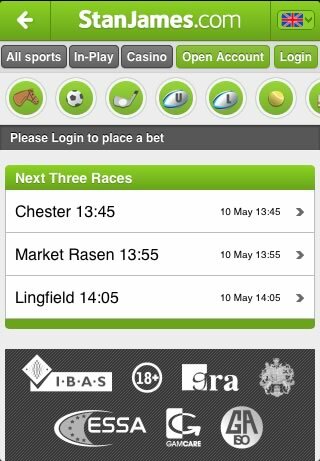 A one stop shop for horse racing fans the app is not, but nonetheless it’s a more than adequate app for the majority of punters, it simply doesn’t have the edge to set it apart from its rivals.